We get a lot of patients asking us questions about teeth whitening – Does teeth whitening work? Are the store bought kits any good? What are the differences between my options for whitening my teeth? No matter your questions, you are not alone. A beautiful, bright, white smile will do wonders for your confidence. In fact, the Mirror reports that 58 percent of men say the first thing they notice is a woman’s teeth. According to Boston University, this desire for a stunning smile has resulted in Americans spending $1.4 billion each year on non-perscription teeth whitening products. If you’re one of the millions wanting to whitening your smile, you have a few options for teeth whitening. We can help you navigate the process and find the best route for achieving a bright, healthy smile. What exactly is tooth whitening? Tooth whitening generally falls within one of two categories – either whitening your teeth through the use of a bleaching agent, or making your teeth appear whiter through the use of abrasives to remove stains on your teeth. Using brushing or polishing to remove extrinsic stains from your teeth. Typically this is done with an abrasive ingredient that scrubs your teeth and removes old stains. Stain removal will not change the color of your teeth, but will make your smile brighter. Bleaching agents such as carbamide peroxide and hydrogen peroxide gel are used to remove the intrinsic staining that causes the teeth to yellow. Teeth whitening is safe when it’s done properly. We recommend that you talk with us at your next visit about the condition of your teeth before you begin any whitening regimen. The biggest side effects of whitening that can occur are tooth sensitivity, gum irritation, root and enamel damage. Gum Irritation is a side effect from the peroxide making extended contact with your gums. The effects are temporary sensitivity, sloughing skin, and possibly whiter gums for a short time. But much like a sunburn, gum irritation will go away. 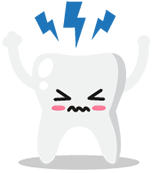 Tooth Sensitivity occurs when you bleach your teeth too often or use too high of a grade of bleach. This can cause uneven white spots and extreme tooth sensitivity. If you have any unknown cavities and the bleach seeps into these spots, it can also be very painful. Our dental staff can help you avoid any of these problems with a bit of education and excellent products. Extrinsic Staining – This is discoloration on the external surface caused by substances such as coffee, tea, wine, tobacco, or other things you eat or drink. It’s best to first prevent extrinsic stains by regular brushing and good oral hygiene practices. However, if you do suffer from extrinsic stains then a professional teeth cleaning is recommended. Your dental hygienist will be able to remove many stains, and your dentist will provide you with recommendations for additional stain removal. These types of stains can be treated to a certain extent with a good whitening toothpaste/ However, the stains can and will build layers if not attended to immediately, so talk to your dentist during your next checkup if extrinsic stains are a concern. Intrinsic Staining – Contrary to popular belief, most ‘yellow’ teeth are caused by intrinsic stains vs extrinsic stains. 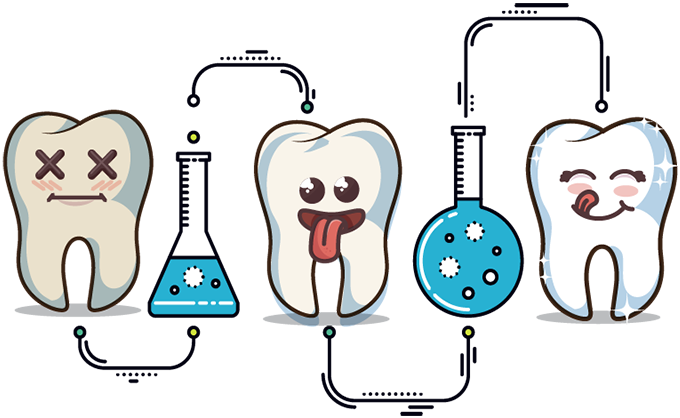 Intrinsic staining is discoloration caused by aging, tooth decay, certain medications like tetracycline or physical trauma to your teeth. This kind of staining cannot be fixed with whitening toothpaste. With intrinsic staining you’ll need to use bleaching agents in order to remove those stains and whiten your teeth. BUT DID YOU KNOW… foods such as strawberries, nuts, seeds, onions, apples, celery and oranges can actually protect and preserve your beautiful white smile. In order to know which option is best to whiten your teeth, you first need to identify what type of stains you are trying to get rid of (intrinsic vs extrinsic), and then understand how effective each of your options will be for those stains. Whitening toothpastes use a combination of abrasives such as silica added to them which help to remove extrinsic stains from your teeth. As such, whitening toothpastes can help you battle the effects of the food you are consuming. However, whitening toothpastes do not contain bleaching agents and will not help get rid of intrinsic staining. Instead, they use a combination of abrasives that will polish stains off of your teeth or chemicals that can break down or dissolve surface stains. So even though they may use the term “whitening,” they are more accurately termed “polishing” products. This can lighten your teeth, but will not remove intrinsic staining. Warning: Whitening toothpastes are not something you want to use daily, as this can cause sensitivity and gum recession. At most, use whitening toothpaste once per week, or skip it altogether and simply brush/floss properly, get routine teeth cleanings, and avoid foods that cause external staining. Cost. Whitening strips can range anywhere from $50 – $100 per treatment. This can add up over time as most bleaching treatments only last 6 months to 2 years before they need to be redone. In the short-term teeth whitening strips will save you money. However, because you will have to continue to pay $50-$100 per treatment, over time whitening strips will be much more costly than other bleaching options. 2D Application. Whitening strips only go on the front part of your upper and lower teeth and are limited in how effective they are at reaching the curves and crevices of your teeth and can leave you with uneven results. Carbamide peroxide needs to sit directly on the tooth for a certain amount of time, making it very difficult for whitening strips to brighten all areas of your teeth. This problem is then exacerbated on people who have crooked teeth, making their flat surfaces looking much whiter and their edges more yellow. Not Custom Fit. Because the strips are made for the masses you may end up having some of the peroxide come in contact with your gums, causing pain. Can Cause Acute Pain On Cavities. Many consumers love using whitening strips because they don’t have to go to the dentist. However, this can cause a problem – if you have cavities you could be in for a very painful experience if the bleach materials get within the cavity. As such, we recommend talking to your dentist and having a checkup before using whitening strips. Also, make sure to let your dentist know so he/she can give you proper recommendations on how to best use them. More Effective. Higher amounts of bleaching agent can be used because the tray is custom fit to your mouth, which lessens the risk of bleaching agent coming in contact with your gums. As such, you can get a whitening gel that contains higher amounts of bleaching agent, making them more effective vs other methods. Low Cost Option. Most dentists charge around $199 for a custom bleach tray and the first several tubes of bleaching gel. At first glance, this may seem a lot more expensive than store-bought whitening strips. However, once you have the tray made then future treatments only cost around $10/treatment. Given that bleaching only reduces intrinsic staining for 6 months to 2 years, over time a custom tray is by far the cheapest option for those looking to continually whiten their teeth. Customized Treatment. Because you are getting the trays from your dentist, he/she will be able to put together a customized treatment plan specifically for you. With whitening trays, make sure you understand clearly how to use it, as putting too much gel on or leaving the tray in your mouth too long can cause damage to your teeth (in addition to causing unnecessary sensitivity and pain). For those who need fast results (i.e. they have family photos or a wedding coming up), then an in-office whitening treatment may be necessary. In-office treatments provide the fastest results, as more bleaching agent can be used under the direct supervision of your dentist. Also, in some cases a light is used to ‘speed up’ the process. An in-office whitening will cost you more but also can give you the peace of mind that you know you won’t mess things up. We typically recommend in-office treatments only for those who need quick results or who are nervous or who don’t want to deal with the hassle of using a take home, do-it-yourself option. Keep in mind, however that because a higher concentration of bleach is used that that the risk of short-term pain due to sensitivity is increased. Perhaps you’ve whitened your teeth before and noticed an increase in sensitivity to your natural teeth. This can feel like a pinging sensation in the center of a tooth or even an intolerance to brisk air, cold water, or hot foods. The sensitivity comes from peroxide based products (the whitening agent found in bleaching strips and dental trays) as they soak through your enamel and reach the nerves within the dentin. Tooth sensitivity typically is common when using higher percentages of peroxide and longer application times. However, two individuals using identical products can have completely different experiences depending on the genetic characteristics of their teeth. Relief to tooth sensitivity from bleaching can be found in time. Sensitivity related to bleaching normally occurs during the bleaching process and will last 2-4 hours after. If you’re unable to tolerate the sensitivity produced by your whitening products, consider trying a product with lesser amounts of the whitening agent, shorter application times, increasing the time between treatments, or using the desensitizing varnish applied at an in-office whitening treatment. For exceptionally sensitive teeth, talk with your dentist to find the right product for you. This includes crowns, veneers, fillings, bridges, and even dentures. Any man-made material placed in your mouth will not be susceptible to whitening with peroxide chemicals. We recommend achieving your desired tooth color before having major work done in your mouth. If you’re wanting to whiten natural teeth past the level of your existing prosthetic teeth, you might consider having new prosthetics made to match the level of whiteness you desire. irst, we’ll take impressions of your teeth to create custom bleaching trays for you upper and lower teeth. These trays are flexible and have pockets to contain the bleach, keeping it off of your gum tissue. You can pick up your trays later that day or the next business day, depending on how early your appointment is. We make them in our office which allows for a quick turn around. We’ll send you home with multiple tubes of teeth whitening bleach. We carry multiple strengths and will suggest a level we feel will be best for you. Anytime you run out of bleaching gel, you can stop by our front office and purchase more without an appointment. We recommend calling ahead before coming in to make sure we have plenty in stock. First, we recommend taking ‘before’ photos so you can compare your new white smile after treatment to what it was before. Once you’re in the chair for treatment, we’ll place a cheek extractor in your mouth to give us a good view and access to your teeth. A hardening resin will be applied to your gums to protect the soft tissue. A desensitising varnish can be used to prevent sensitivity caused by teeth whitening. The bleaching agent is then applied directly to your teeth. A UV light will assist the bleaching gel to achieve a brighter white. After 20 minutes, we remove the light and gel to assess if more bleach is needed. If everything is in order, we will remove the resin and the cheek extractors and send you home with a new, bright, white smile. If you’re considering whitening your smile, call our office for a consultation. We can help you to whiten your teeth with minimal damage and sensitivity with a tray and bleaching syringes you can take home or an in-office treatment for a dramatic same-day transformation of your smile.